Teach students essential skills with engaging activities. Explore key reasoning skills from the Common Core and Next Generation Science Standards and strategies for teaching them to students. Then, discover fun, research-based games and activities to reinforce students’ reasoning skills. This practical text provides clear guidance for incorporating these tools into your classroom to prepare students for academic and lifetime success. Help students develop the ability to critically analyze evidence and draw valid conclusions. Refine students’ reasoning skills—using a combination of analytical and intuitive reasoning—to help them prosper in 21st century colleges and workplaces. Gain classroom games and activities to support reasoning lessons. Provide students with the tools to reinforce their reasoning and relay complex information. 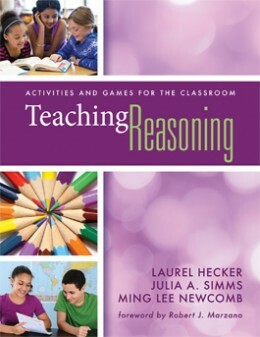 “Offering a wealth of tools for reinforcing student reasoning and the transmission of complex information so essential for academic and lifetime success, Teaching Reasoning is a versatile and highly recommended school curriculum supplement resource that is exceptionally 'user friendly' for both classroom instructors and their students."